Camping in wild country, amongst mountains, woods and moors, is one of the great experiences of outdoor life, an experience that brings you closer to nature, closer to the earth. I’ve camped wild on many thousands of nights in many countries, in all seasons and in all types of weather. Without those camps, even the stormy ones, the uncomfortable ones, the insect plagued ones, I would have missed much and my life would be the poorer. When I began camping wild as a teenager I didn’t give much thought to whether it was legal or not. I was aware that camping in a farmer’s crops might not be popular but I didn’t want to camp in places like that anyway. As I grew older I became aware that wild camping wasn’t a right but was accepted in some, mostly upland, areas but not in many others. I ignored the statements in outdoor books saying you must ask permission before camping as this clearly wasn’t practical and clearly wasn’t what the authors actually did. I learnt to be discreet and the advantages of early starts, late pitches and a green tent. By doing so I managed to avoid any trouble with landowners, even when I walked from Land’s End to John O’Groats and often camped in rather too developed lowland areas. Many others do the same. 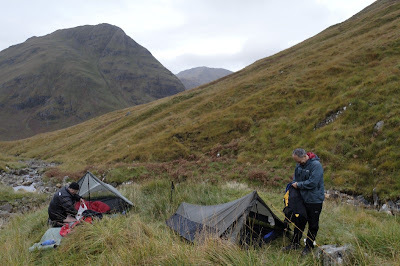 This isn’t an ideal situation though and hardly encourages people to try wild camping so I was very pleased when the Scottish parliament included a legal right to wild camping in the 2003 Land Reform Act. It hasn’t changed my wild camping habits in the slightest but it may well encourage others and it does mean that if anyone did object I now have the law on my side. In England and Wales wild camping still isn’t legal however, though there are areas like the high fells of the Lake District where it’s accepted. Now wild camper Darren Christie, who blogs as whitespider1066, has started a petition to the UK government to legalise wild camping in England and Wales, for which he is to be congratulated. You can sign the petition here. How effective such petitions are I have no idea but I would think that the more people who sign the more likely a petition is to be noticed. The picture shows legal wild camping in the Moidart hills in Scotland. Photo info: Canon EOS 300D, Tamron 11-18mm lens at 18mm, f5.6@1/100, ISO 400, raw file converted to JPEG in DxO Optics Pro. Thanks for the heads-up on this Chris, I think this could be the start of a very important rolling ball. I've jumped on the band wagon at www.outdoorsmanning.com and written to my MP, David Curry (Conservative) who says he's taking it up with the government. Surprised no-one else's commented on this yet... hopefully it's because they're all busy signing the petition! No point writing to my MP as I'm in Scotland (and I really don't think Scottish MPs should vote on English issues). My piece has been mentioned on various other outdoor blogs. I can't remember another issue uniting so many outdoor bloggers before. There is however a fair amount of opposition by some wild campers (see the threads on the uk.rec.walking newsgroup and Outdoors Magic) on the basis that it'll mean more roadside camping and litter if it's passed and that raising the profile of wild camping will make it harder as there'll be a clampdown - neither of which I think are likely to happen. Response back from Hilary Benn, via my MP, is disheartening really. Posted it in full at www.outdoorsmanning.com, but don't surf there looking for hope!